We didn’t initially plan on installing a toilet. We planned to lay down peel and stick tile and install our new bathroom furniture from IKEA. We’ll after our toilet started leaking because the previous owner never replaced the bolts on the toilet tank, we didn’t have much of a choice. Besides that I have a chubby hubby and sitting on our previous toilet was like using the bathroom at the Barbie playhouse for him. So, here we are. It’s our first DIY Date Night and we are installing a toilet. Hooray. Hooray. Installing a toilet is a job I’d rather not do, but I was super happy to spend soem time with hubby and get a new toilet. It looks awesome in our budding bathroom, but you’ll have to wait until the end to see it. In the meantime if you’re online searching for a how-to-guide to installing a toilet, you’re in the right place. Two glasses of wine for me and a Corona for him and we’re on our way. The first step to install your new toilet is to turn off the water supply to your bathroom. Second, lay down a plastic tarp (or some old sheets) over your bathroom floor. That old wax ring can get your bathroom messy if you step in it. Bring all of your tools into the bathroom and organize them. Hubby and I had to work together to do this. Next, hubby lifted the toilet bowl and I helped him align the opening with the floor flange and bolts. Once he sat the bowl down, he had to twist it to make sure it spread the wax and made a good seal. You might even want to sit on the seat to firmly compress the wax. Next, place the washers and nuts on the bolts on each side of the toilet bowl and secure them. Then, cover the bolts with your bolt caps. 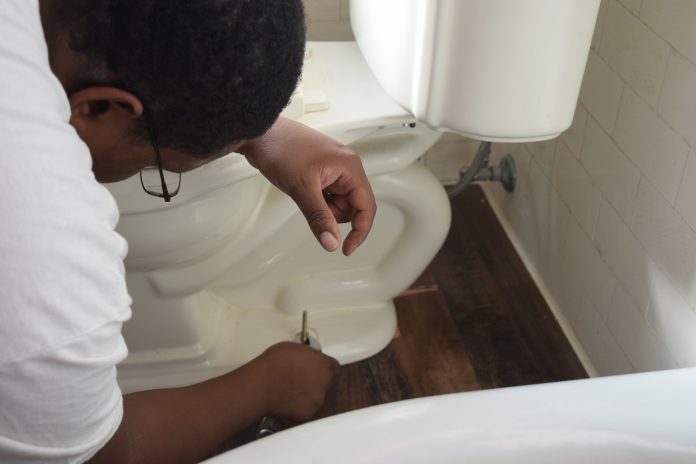 Finally using the same process that you used to remove the old toilet, place the new toilet tank on top of the bowl and secure it using the nuts and bolts. Use your new hose to connect your tank to the water supply valve. Turn your water back on and do a practice flush. As long as you’ve go no leaks, you’re done. Here’s our new toilet. I love it! We are nowhere near done. Over the next two months we will be redesigning our upstairs bathroom. Catch us next Friday. On our next DIY Date Night we’ll be putting down our peel n’ stick to re-tile the bathroom floor and putting in our new bathroom vanity from IKEA. See ya next Friday! Lorieal thanks for commenting. Our garbage men took them. Great job. My husband and I have replaced 2 toilets in the house, but still haven’t figured out how to dispose of the old ones! What did you guys do?